Aahhhhhh…….., the feeling of a brand new baby’s head in my hand. And then, the feeling as she goes into a still-point, and energetically takes me along with her. A warm bath, or “LeBoyer Bath,” is how to induce a “stillpoint.” And a stillpoint is how to help a baby let go of the stress of birth. If you feel this picture, instead of just look at it, you can feel the deep peace that is healing her. It is time for babies to be born in wholeness and stay whole. It’s time to practice birthing techniques that support the innate radiance of our babies and protect their innate Oneness. 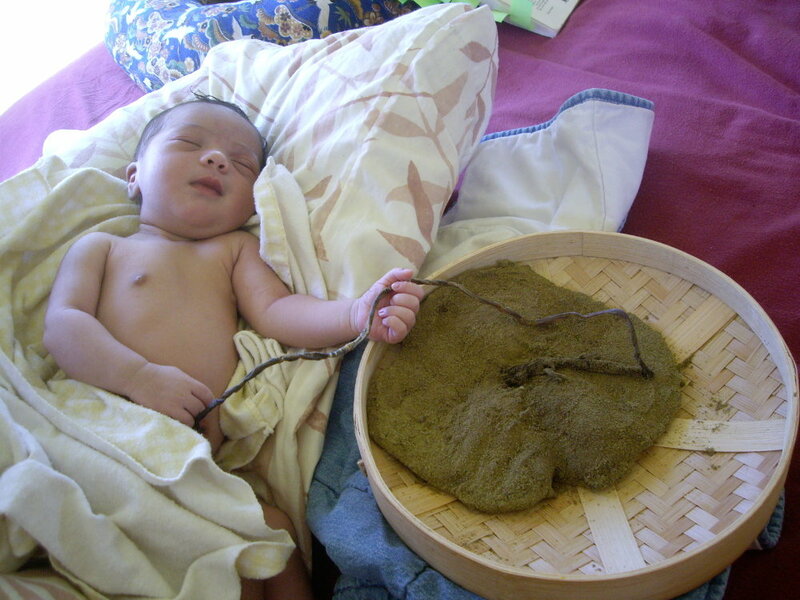 Lotus Birth is a choice, a gift from parents who recognize its significance. The first step toward a Lotus Birth is to allow the cord to stop pulsing before cutting it. Amazing transformations take place in the body of the baby as she morphs from being a water baby into an air world. When baby opens her eyes for the first time, all eyes and hearts satisfy their longing that all is well. Mother is flooded with relaxing hormones. Her relief speaks to her hormones, who speak directly to the placenta, as if saying, “Your baby is safe and well.” With this knowledge, she relaxes, the placenta completes its work, releases and the placenta is then ready for its own birth. It only takes 10-15 minutes. It is not necessary to hear the typical scream that accompanies the cutting of the cord and that first forced breath. Often within two minutes, the cord starts to feed baby progressively less oxygen to gently encourage her to breathe on her own. There is no need for a baby to scream. Her lungs open gently and she breathes without stress. Taking this a step further, Lotus Birth is not cutting the cord at all. Lotus Birth softens the birth experience and allows birth to go back to a safer, more natural state. Like water birth, there seem to be only positive effects of Lotus Birth on a baby and her family. They are all unseen and can only be felt. Keeping the cord in tact means that baby and placenta stay on the altar of the family bed, visited only by the closest of family and friends. This keeps baby in the security of the family and slows down the pace of life. Nobody goes shopping with a newborn and placenta in tow! In fact, a mother does little more than go to the bathroom anyway. As the cord is kicked off, baby is gently showed around the house and maybe to a few close friends. In appropriate timing, baby is taken outside and introduced to the stars and moon, sun and rain. These first few days set into the mind of parents that life happens in perfect timing, according to baby’s readiness. By watching baby’s reaction, parents do the right thing at the right time. When people hear about Lotus Birth it always creates a reaction. Most are fascinated at hearing something so different and say immediately, “That feels right.” Some though, will scream with the trauma of their own cut cord. Walk in with openness and see how this feels to entertain it for your baby. Understanding its benefits and wishing them for your baby makes the decision easy. Would you like your baby to experience these gifts? Ask your baby long before labor and decide if lotus birth is to be her path. If so, the logistics will easily fall into place. It takes this commitment to make the care hassle-free. This advance commitment seems to be felt by your baby as a high level of security when taking in her first breaths. Keeping the cord in tact allows the baby to hold her full vitality and radiance. For babies to be born to parents who honor them with a Lotus Birth means that as a generation, we are completing this epoch of separation and moving into Oneness. The babies being born do not need to experience separation as their core issue, as so many of us parents have had to, and so, they draw to them a different birth. There is an entire chapter on Lotus Birth in Sacred Birthing, Birthing A New Humanity book. It is all from my experiences in the last 24 years, since almost all of my births have been Lotus born. This chapter informs you from start to finish, and you will understand it and how to make it happen. Happy Trails! Your baby thanks you. It’s really a chance to pray, making a medicine wheel. I ask what the intention is for this wheel and find that it is to raise the vibration of the camping area so that this area becomes a camp for those who seek to be more conscious, and each summer there are many attracted with a higher purpose of conscious refinement. I call out to the Directions for the size and form this wheel is to hold. I call out to each stone, “Who is to be placed next?” I ask where each needs to go to support this intension. It is a process that is not about speed. After 5 hours I am only 1/3 done and am whooped. These stones are heavy. Eight of them are much too heavy for me. Tomorrow I’ll complete it. I take a swim at placenta rock in this 90 degree heat. What a good name for this boulder! The Medicine Wheel is to raise the vibration of the campground. Five more hours and lots more prayer takes me through the many layers of intension for this wheel. Forgiveness of self for all humanity is the majority prayer as the outer circle and the inner circle is formed. I finish not today but in the third day’s morning sun. 12 hours of deep prayer for humanity’s awakening created this rock formation that will silently sit in the riverbed till the next snowmelt. On the fourth day, the camp area erupts. Young people screaming to each other, not talking, not yelling in fun, but screaming their conversations. I don’t understand. They are throwing rocks, big rocks, down at the dam, smashing them down on others. I haven’t seen this kind of behavior before. Then a woman walked past me and said she had heard them screaming about “meth” and we both understood. Later talking to David, he told me that a psychologist said that meth is something that supports the ego to be unleashed. That’s just what was happening in the behavior that I saw. It was scary to see the ego take over. The next morning, two days after the medicine wheel was finished, I realize that I feel finished here after the wheel was done. I look below on my morning walk to my meditation tree in the sun and see that the three stone dams that so nicely held the deep waters for the swimming hole have been destroyed. All the rocks are strewn all over. I hear, “When the vibration rises, chaos results in order for the change to occur.” I think back on several situations and think of the truth in this. The stunning house I was to rent high up the mountain was reclaimed by its owner. I am sad that I will not be living at this place that birthed my book, Sacred Birthing, Birthing A New Humanity. I realize that I must be heading the wrong direction. Ok, where DO you want me? Why am I here??? Show me so that I get it! Birth is magnificent. With the high drama births so common today, we have lost sight of this magnificence, and as a culture have begun to fear birth. Though when allowed to progress in its own way and at its own pace, birth shows us how each baby needs to be born, and how each mom can claim her initiation. We have come to fear birth because we have lost our birth wisdom, the inner wisdom passed down from our mothers and grandmothers, our aunties and sisters. We no longer meet at the well, the kitchen, or the red tent to share the stories that once strengthened us. It’s time to change this. Babies are asking for something more aligned with who they are. Many children being born are incarnating on Earth for the first time and come to inspire goodness. They have no karma and no wounding, and without these, they are born with great life force and health, but our birth practices introduce vibrational harm that results in severe health challenges. When they are born quickly, without time to interfere, they prove to be in the best of health. Trauma at any age hurts or makes us scared, and is difficult to integrate. Trauma at birth makes a newborn constrict physically and emotionally. The nerves that have previously been fully open and receptive in the safety of the womb, now constrict and tighten, and fear is felt often for the first time. Emotionally, a baby shuts down and turns within. Baby’s body-consciousness declares: “This hurts,” and remains in a protected stance, trying to make sense of this feeling. Baby’s soul-consciousness makes its first earthly decision: “This is a hostile world.” All later decisions will support this first one and become the seed of a baby’s personality. Midwives know that a baby’s personality is created by its birth. We see it all the time and watch as babies grow. Who a baby becomes, comes from mom, dad, and from baby’s own past lives. The journey through conception, gestation and the birth experience crystallizes and imprints what we are born to heal: time issues, gender and food issues, worthiness, our default emotion, relationship choices, turning toward nurturing or withdrawing. These and more influence a lifetime. Everything is remembered about the circumstances of our birth whether it was spoken or thought: What was the doctor thinking about me? Were the nurses caring or too busy? Was mom conscious? Where was Dad? What were the emotions present? What was my first nourishment like? How will this life challenge me? Which siblings support me? Why did I choose these parents? What is my soul-design? It is all remembered in the recesses of our heart. Without trauma, a newborn knows it. With trauma, it will be remembered as and when the trauma heals. Our birth memories are our road map to the healing of our lifetime. As a birth therapist, I found that few adults believe they can remember their birth experience, yet we all can. It is written within every cell of our being. Our body remembers and with a little help, what has been subconscious can be made conscious to bring about great healing. Not only can we heal, but remembering our birth makes us absolutely aware that all babies remember and are conscious. Since babies are conscious at birth, they remember how they are treated. Our treatment shows them how precious and worthy they are. How do we wish to welcome them? Sacredly. Softly. As a celebration. With our greatest presence and inner stillness. With love. Birth isn’t created in the hours of labor but with every feeling and action both parents have, from their very first inkling of a baby, right up to its birth. This ‘field of birth’ then becomes the energetic force field of pregnancy that carries a mom into her birth. Create it with trust, and do your very best for your baby. Create it with fear, being too busy throughout pregnancy, or thinking, “this (fast food, drink, joint, cigarette…) won’t matter,” results in the drama so common in modern birth, because your gut emotions about your upcoming birth create a vibration. This vibration will always attract a birth to match. Can you purge your fears and create inner peace and a joyful anticipation about your birth? Can you and your partner practice harmony to offer your baby your very, very best? Birth is an enormous passage for all mothers, but as a midwife, I see that the moms who worry through pregnancy have more pain, and those who are happy and assured end up with a beautiful home birth. In the past, we have seen this as a woman’s empowerment, but what if vibration is the key to what determines a birth? What if it also determines the pain or ease in which you give birth? Vibration is easy to understand when you imagine a line graph. Imagine one of emotional feelings ascending in vibration from the lowest to the highest: hopelessness, panic, fear, anxiety, insecurity, unsure, surrender, ease, contentment, positive intent, well-being, appreciation, gratitude, joy, bliss, love and ecstasy. Our mental patterns are also vibrations: resigned to the worst, self-judgment, dread, chaos, constriction, struggle, negativity, ‘trauma/drama’, restlessness, surrender, tolerance, hope, acceptance, openness, peace, trust competence, creative, empowered, coherent. Reread these and feel each one, and you will see what your baby would be steeping in if this were your predominant feeling or thought in pregnancy. Our self-talk reflects where we are at any given time. Vibration is an exceptional tool for birth. Certain biological states only exist at certain vibrations. Pain is a biological state that does not exist at a high vibration. So, if a mom spends her pregnancy at a happy high vibration, she is lots closer to the higher vibration where there is no pain. More and more births are being created in ecstasy, yet most women keep this to themselves as they are not believed when they share their stories. Orgasmic/ecstatic births are happening and are a product of a high vibration. Your vibration through pregnancy is your pathway to an ecstatic birth. Another aspect of orgasmic birth is that two different vibrations cannot exist at the same time and space, so when feeling the vibration of joy, there is no room for the vibration of doubt, fear, anger, etc. Staying where it feels good trains us in using vibration. This is our spiritual practice on our way toward sacred conception and throughout pregnancy. A high vibration also protects the consciousness of your baby. With this protected radiance, a baby retains her innate sense of self-love. This is not something she will have to work to regain, as we have in our forties and fifties. It is hers from birth. A high vibration retains the multi-dimensional abilities (healing, telepathy, stimulating creativity…) that a baby brings to share. These babies are not choosing to be born at the low vibration of self-judgment and karma, but at the other end of the spectrum, the vibration of coherence, trust and love. The babies being born now are a higher consciousness/higher vibration and are extremely sensitive and cannot tolerate the birth practices that do not take vibration into consideration. What are we doing at birth to reduce vibration? Anything that results in baby or mom feeling fear or pain. We are scaring mothers, and bringing pain and fear to the unborn by using things like fetal heart monitors; ultrasound/sonogram, internal monitors. At birth, we use forceps and vacuum extractions, instead of giving mom more time, or getting her to squat; we cut the cord before breathing is well established, making baby fear death at the moment of birth; we separate baby from mother and father; we give shots and stab heels; we are unconscious in our care of the newborn; and we circumcise. Because of today’s version of birth, trauma and its repercussions are being seen in generations of children, and these traumatized children are called ‘normal’ because little else has been seen in medical birth. The most significant harm comes however, from the drugs that are used at the time of birth. Picture this: As mother is learning to work with labor and opening to the ever-increasing flow of Divine energy moving thru her body, the vibration of mother’s body is rising. The baby’s body within mother also experiences this. As labor progresses, mother incorporates greater amounts of this refined energy and her vibration is rising more quickly. As it gets most intense, this energy prepares baby’s body to mesh with its soul at this highest vibration. Body and soul mesh most coherently like a hand in a well-fitting glove. Baby is securely rooted into its body, with a fully functioning, pristine nervous system. When this happens at birth, baby is at ease in her body, is involved in life surrounding her, and thrives from the very beginning. When a pain medication is given, the vibration of mother and therefore baby’s body, suddenly plummet in response, yet the vibration of the baby’s soul remains high and constant. The impact of an epidural causes a great energetic discrepancy between baby’s body and soul, previously aligned before medication was given. The soul is not able to come fully into the body because the nervous system shuts down from the depressing effect of drugs on the vibration of baby’s body. The soul energy previously aligned to the body is now, no longer in sync. They are out of phase. Baby’s most delicate levels of senses and multidimensional abilities are eliminated. This pulsation is cumulative however, so the young baby may not be noticeably affected at first. Eventually, the growing child will perceive these as jolts of energy: she will act out this inner experience of too much discordant energy, she is not able to sit still and is hypersensitive to stimulus. This is an energetic description of a child with Attention Deficit Disorder. A body was not designed to carry discordant energy. America’s epidemic of A.D.D. has been caused by this vibrational discrepancy created by the epidurals administered to mothers at birth. Plus, when a mother is given an epidural, she gives away her initiation because she gives credit to the epidural. She has not discovered her new inner stance of “I did it! And if I can do that, then I can do anything!” Parents need to be advised of the toxic and vibrational risks of epidurals and no one is speaking. If the truth were told, all parents would protect their babies and find harmless options. When we respect the nature of birth, we are open to learn from it, we wonder, we listen and await the answers within. With an attitude of trust, we move forward one step at a time. Parents are taking their power back in birth, no longer enduring what is being offered as modern birth. Instead, they are creating what feels best to their hearts. This is a powerful force, and it is self inspired for the good of baby, mama, her lover, the family and the transformation of Birth itself. In an atmosphere of love and trust, un-medicated natural birth protects the vibration of a newborn. It is where the mother finds Ecstasy, and as this occurs, birth returns to the perfection that nature intended all along. By sacredly moving into birth, parents reconnect with who they are, and give birth to their babies in a way that is safe, sacred, at a high vibration and most meaningful to them. Birth is then the highest alignment of body, soul and planetary energies to support each baby’s full potential. And then, the full radiance each baby holds is a blessing to the Earth. I am being taught to journey through time, space and dimensions. What good tools I have developed to be ready for this – past life therapy, birth therapy and midwifery. Ultimately, I am to journey for souls in birth, the birth itself, and death. I am to go into the future/past to see information and bring back what is to be. I am to un-wrinkle the karma in mom, or release the reason for pain… How? We are reconstructing Telos (the 5th Dimensional city inside Mt Shasta) in our studio. It is beautiful, perfect and meaningful in every degree, color, alignment. It’s made of crystals and stones in perfect geometries. Temples are in exact placement to support love in families and all individuals. Nature grows in the exact places and ways to support human development. There is so much excitement in this discovery. Terri N is working on with us too. One is invited into this project when it is time. The city is like the body in design. Perfection. Divine. One roof most intrigues me. It is made of Crisophase, beautiful, translucent, green. Inner authority is the most noticeable ingredient of each person in the project. By working on the “model,” it changes our bodies. Such precision, such delicious sweetness, such relevancy. It all matters. It’s all beautiful. It’s all a temple. It’s all sacred. It all reflects love. It’s rounded and made of materials we don’t know how to build with: gemstones and minerals. They are not encased, the whole building is made from them. There is no structure used to build it into form. It is built of consciousness. There are waterways the moment you need refreshment, thirst, or a change of pace. There is a red ribbon across the front. It is cut and I walk in. I’m in kindergarten again and it feels good. Seven pregnant mamas, two papas, and five apprentices came to an informal talk I was invited to speak at. What a blast! There were all kinds of births, and all were open to taking one more step to be more gentle for their baby. It was a lovely evening in Mt Shasta at the Flying Lotus next to Berryvale. I met a woman who has held a vision, since 1988, of an incredible Healing Sanctuary given to her by St Germain! (Check it out at: http://shastavortex.com/retreat.) She has been here working on it since then making inroads in the zoning committee. Everything that I felt was stumping me. She gave me the homework to create EXACTLY what I want in a Birthing Sanctuary without any constricture (is that a word) except to stay under $25 million. What a delicious assignment. Do it exactly as you would like it to be! It is getting clearer and more profound. I have been camping two+ weeks at the river,and until now, it has been silent except for the wind through the Pines and the pure water’s gurgles. Lots of reflection, loads of letting go. The Earth is such a spectacular healer. Thank you Nature. Thank you Mother Earth. Today I’m asked to make a medicine wheel in the dry riverbed where there are millions of rock-beings just sitting in the sun . In spring, this is all under water with the snowmelt, but now there is nothing but rocks of all sizes between the two rounded riverlets of icy cold water. I am camping on the cliff overlooking this vesica pieces of flowing water.